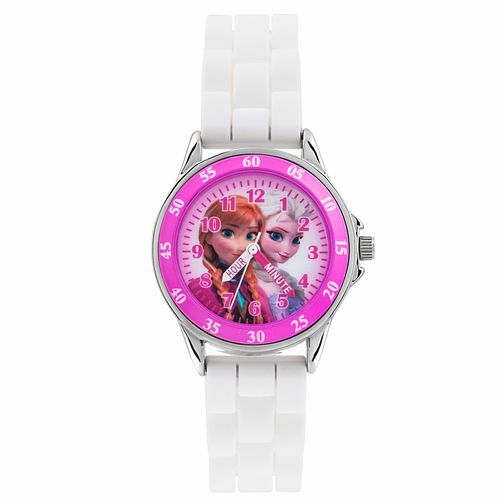 Make learning to tell the time fun, with this cute Frozen time teacher watch. Featuring Elsa and Anna on the easy to read dial, vibrant pink bezel and fresh white strap. A great gift idea. Children's Frozen Time Teacher White Rubber Strap Watch is rated 5.0 out of 5 by 5. Rated 5 out of 5 by Anonymous from Perfect present for my 4year old My 4 year old wanted a watch, more as a novelty than anything, and it had to be Frozen! I was really impressed with this when it arrived, got everything you’d want and more for the price. Face really clear for learning and doesn’t come with a big price tag given that she may well move onto another “favourite” character/film in a few years.